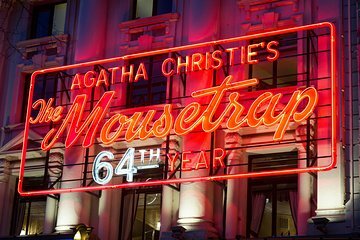 Get caught up in one of Agatha Christie’s classic murder mysteries with a ticket to the ‘The Mousetrap’ at London’s St Martin’s Theatre. Adapted from a story penned by the masterly Christie, this suspenseful play is the world’s longest running show, and has been transfixing audiences since its opening in 1952. Keep guessing as a group of suspicious characters, trapped in a hotel by a blizzard, are picked off by a murderer in one nerve-shredding twist after another. The final unmasking of the culprit is a legendary West End secret! Make your own way to St Martin’s Theatre in central London, and take your seat for this classic murder-mystery stage play, adapted from Agatha Christie’s short story and radio drama of the same name. A fixture of London’s West End since its opening, this hugely entertaining play is the world’s longest running show, and tells the story of a group of people trapped by snow in a country house hotel, who discover, with nerve-jangling results, that one of them is set on a murderous mission. Sit on the edge of your seat as the plot twists, turns and throws you on and off the scent with Christie's trademark, silky ease. Then, gasp aloud when the shocking identity of the murdered is finally revealed — one of the best-kept secrets in theater history! You have the choice of two seating options for the performance. Standard-price seats offer a good view of the stage and are usually located in the rear stalls or dress circle. Alternatively, upgrade to top-price seats to enjoy a full view of the stage and be closer to the action. After the 2.5-hour performance, including an interval break, your experience ends when you take your leave of St Martin’s Theatre. It was great to see such a classic play on the West End. It was very easy to exchange the voucher for a ticket. I had a terrific seat, but the theatre was nowhere near full, so I was able to move forward and have a bit more space around me, as the seats were tight. The area around the theatre Charing Cross Road seemed a little seedy to me and I walked up Shaftsbury Ave where there were more people to catch the bus to my hotel. The Mousetrap was so much fun. We so enjoyed this Agatha Christie play. It was very convenient and easy to take our electronic copy to the box office and receive our tickets. Highly recommend seeing the Mousetrap! A lot of fun and great to be part of the history of this play. Good atmosphere at the theatre and well acted by the cast. A nice way to spend an evening ! SUPERB!! Quality show and actors/actresses. Would see again. We had to go back and forth by email with the actual theater company in London but ended up with great seats and no hassle when we got there.